For a long time, a rock-bottom price was the key to leading the lowest end of the subcompact new car market. It was a game at which the old Hyundai Accent excelled, and the three-door Accent GL hatchback was usually one of the cheapest new cars in the U.S. So what if it was loud, offered little in the way of features, or was uncomfortable in virtually any driving situation. Then Honda came along in 2007 with the groundbreaking subcompact Fit, which combined excellent interior packaging with a fun-to-drive character, and wrapped it in endearing styling. It wasn't the cheapest subcompact on the market, but it was still inexpensive, and its combination of style, packaging and driving pleasure upped the ante for other subcompact makers. 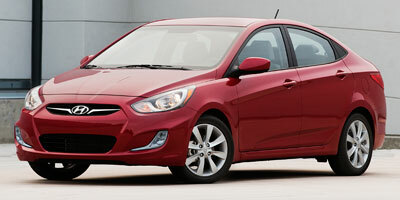 The post-Fit subcompact market is subsequently a tougher place to compete, but the all-new 2012 Hyundai Accent comes to market ready for the challenge. 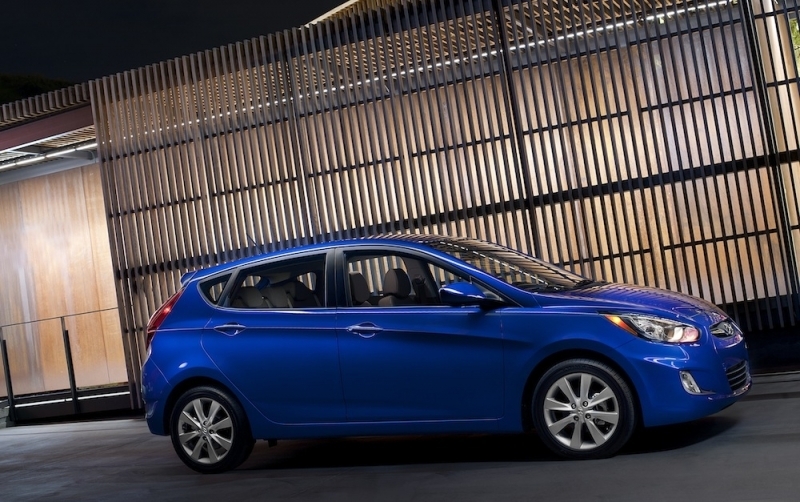 Both the sedan and five-door hatchback look good inside and out, offer numerous standard and optional features and get great fuel economy, yet somehow the new Accent manages to undercut comparably equipped competitors by hundreds, if not thousands of dollars. It may not be the cheapest car on the market anymore, but if you're looking for a value-packed small car, the 2012 Hyundai Accent is tough to beat. The new Accent is a sharp-looking little car, with sophisticated styling that belies its low price. The interior design is also first rate, as are the materials used to construct it. But all that aside, probably the best thing about the new Accent is its engine: A 138-hp 1.6-liter direct-injected four-cylinder that not only bests its competition in power, but in fuel economy, with 30 mpg in the city and a whopping 40 mpg on the highway. There is one major complaint with the Accent, and two minor ones. The big one is the electric-assist power steering, which feels funny and artificial at all speeds. The second is acceleration, which was pokey despite Hyundai's bragging about the most powerful four-cylinder in its class; blame the fuel-economy biased transmissions. Finally, rear visibility was poor in the sedan and terrible in the hatchback. The 2012 Accent's quiet highway ride makes it feel like a larger car. 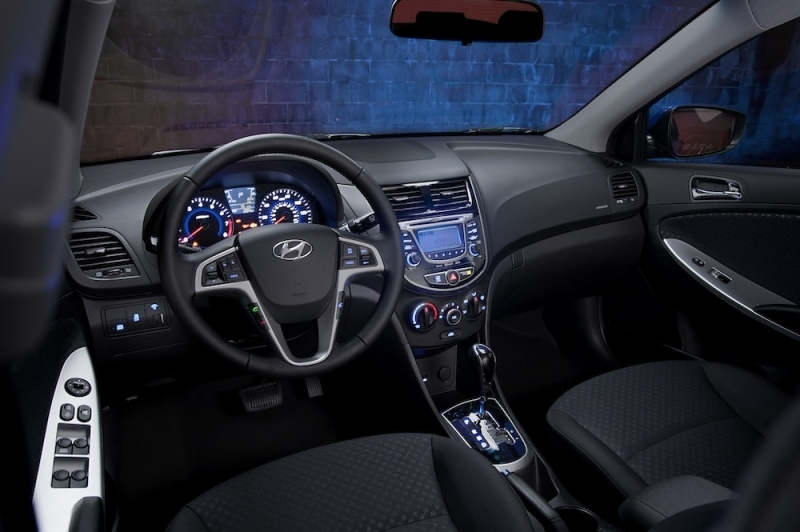 Hyundai went to great lengths to reduce road noise on the Accent, and it shows with minimal wind and road noise in the cabin. The four-cylinder engine is quiet for the class, and the smooth shifting six-speed automatic and manual transmissions go about their business without fuss. The suspension strikes a good balance between ride comfort and control, but it should be noted that most of the roads we drove on were fairly smooth and straight desert byways. The biggest dynamic complaint is the steering, which feels artificially heavy, has a peculiar on-center dead spot, and required constant small corrections even though crosswinds were light. There is only one engine available in the new Accent: a 1.6-liter four cylinder that puts out 138-hp and 123 lb-ft of torque. You can get either a six-speed automatic or a six-speed manual transmission, with all the power going to the front wheels. Hyundai's biggest advantage over its competition may just be fuel economy. The Korean manufacturer is quick to point out that the Accent’s 40 mpg highway is available across the board, not just in specialized fuel-sipper models like with the Ford Fiesta. This is thanks to direct injection, an advanced fuel injection technology that squirts gasoline directly into the combustion chamber, thus allowing for more precise fuel delivery for reduced consumption and better power. The Accent's fuel economy estimates are 30 mpg in the city and 40 mpg on the highway, but that's only half the story. Automatic-equipped Accents come with an Active ECO mode, which the company says improves fuel economy an additional seven percent. Do the math, and you get 32 mpg city and 43 mpg highway. The sedan body style carries over, but Hyundai has ditched the three-door hatchback body style on the new Accent in favor of a new, more practical five-door hatchback. Regardless of whether you get a sedan or hatchback, you'll be greeted with a plethora of standard features. All hatchbacks and automatic-equipped sedans come standard with air conditioning, a USB input for the audio system, tilt steering wheel, a six-way adjustable driver's seat, and power windows, mirrors and door locks. Little of that is groundbreaking in bigger cars, but it's rare in the subcompact class, especially in models costing less than $16,000 including the freight charge. 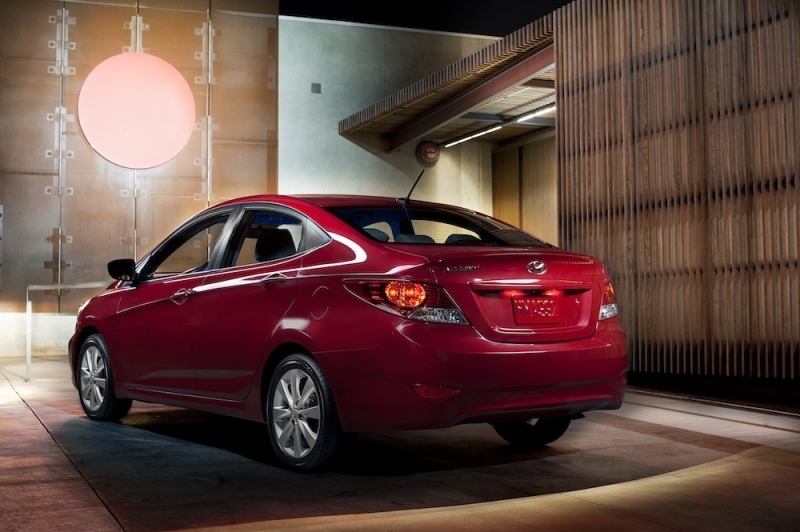 The new Accent's modern interior bears a strong family resemblance to the Sonata and Elantra. Styling highlights include metallic, chrome, and piano-black accents and a leather-wrapped steering wheel and shift knob in some models. It's also spacious, with plenty of head- and legroom for the driver and even a decent amount of room in the rear seats. Cargo space is especially good. 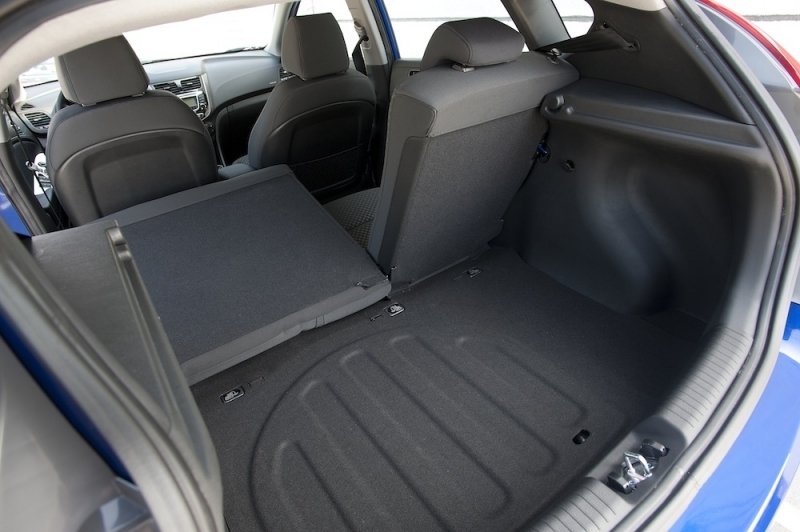 The Accent sedan boasts 13.7 cubic feet of trunk space, and the hatchback offers 21.2 cu-ft behind the rear seats and 47.5 cu-ft. with the rear seats folded. Hyundai has translated the swooping lines found on the Sonata and Elantra to the Accent with surprising effectiveness. In fact, it’s possible that the look works better on this smallest Hyundai than on its bigger siblings. A strong character line runs up the side of the Accent, defining the trunk on sedans and the lower hatch on five-door models. The Accent's chrome grille, body-color mirrors and door handles, and neatly integrated available fog lights add an air of sophistication. This is still a price-sensitive segment, and the Hyundai Accent offers a very good price-to-stuff ratio. A stripped-down manual-transmission GLS sedan without a/c or a radio is $12,445, but a more realistic base model is the same car with a $1,750 Comfort package that adds power windows, keyless entry and a few other items. That's all standard on the $15,195 GLS sedans with an automatic transmission. Hatchbacks start at $14,595 for a manual-transmission GL; the automatic adds $1,200. The SE hatchback adds Bluetooth and a leather-wrapped steering wheel for $15,795 with a manual, or $16,795 with an automatic. Other solid cross-shops include the Kia Rio and Ford Fiesta. Heaping praise on new Hyundai products is beginning to get a little embarrassing, but here we go again. The Accent is as radical a departure from its predecessor as the Sonata and Elantra were, in one stroke going from an unassuming backmarker to one of the best vehicles in its class. It'd be nice if Hyundai could make its steering feel less artificial, but overall the Accent offers features, style, options and space at a price that will surely once again have its competitors scrambling.